There may have been other candidates, but the Astros' Jose Altuve was by far the most deserving player and the voters agreed. 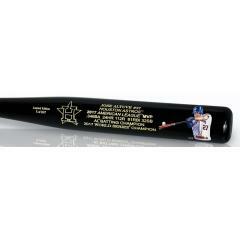 To honor the 2017 American League MVP, we are pleased to present this limited edition art bat honoring Jose Altuve. The bat features exclusive art by Jolene Jessie, and a listing of Altuve's 2017 season accomplishments and statistics. He was a team leader throughout the season, and played a key role in the Houston Astros first ever World Series Championship. This bat will look great displayed on any wall in your home or office. Order yours before it is gone. Due to the limited nature of this item we must charge your credit card for the full price immediately upon taking your order. This policy ensures we reserve a bat for you. We will confirm your order by Email. This bat is not game used. Please allow 4 to 6 weeks for delivery.